Ellison's Orange is a superb traditional English dessert apple, closely related to Cox's Orange Pippin, but with a notably juicier flesh. It has the attractive orange flush so typical of English apples. Ellison's Orange is known for its background aniseed note which enhances the aromatic complexity so typical of a Cox-style apple. In a good year the flavour of Ellison's Orange makes it one of a very small number of varieties which could truely be put on a par with Cox's Orange Pippin. Please fill in the details below and we will let you know when Ellison's Orange apple trees are back in stock. Ellison's Orange is in flowering group 4. Ellison's Orange is partially self-fertile, but fruiting will be improved if there is a compatible tree of a different variety nearby. Ellison's Orange is a mid-season variety, and generally easy and reliable to grow. 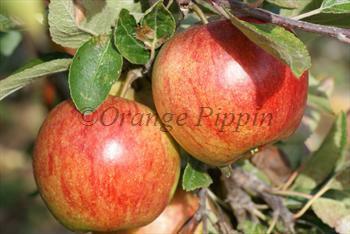 It makes a good alternative to the more temperamental Cox's Orange Pippin, and has better disease resistance. Raised by the Reverend Ellison in Lincolnshire, England, c1905. 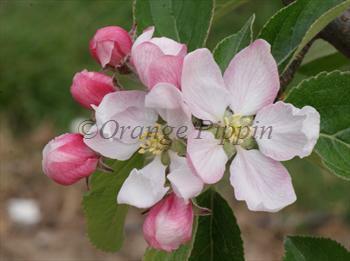 Believed to be a cross between Cox's Orange Pippin and an old French apple variety.